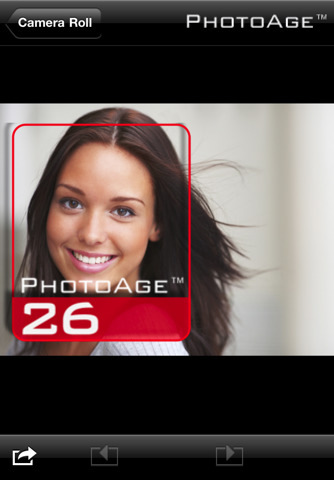 PhotoAge is an app that combines social networking with photography as it analyzes photos of people that you upload into it, in order to guess the age of the person in the photo. It was developed by Percipo for an iPhone, iPod Touch, and iPad and it costs $0.99. “Snap a picture or grab a Facebook photo and find out how old you ‘really’ look,” is the headliner when you open up PhotoAge. I am not sure I understand why you need an app to tell you how old you really look, but I do know that the surest way to feel awful about yourself is to purchase this app and use it on one of your better pictures. Start by choosing one of the three icons facing you on the start page: Camera, Facebook, or My Photos. If you want to get a picture off of Facebook for the app to process, then you have to sign into your account using the app. Once you have loaded a picture, neon green, perpendicular lines with a small box in the middle start jumping around the screen to give the impression that the photo is being scanned. They go on for a good minute or two, sometimes five, before determining the age of the person in the photo (the victim). The person’s head is then framed in a box—we gotcha!—with the words, PhotoAge 65, listed in it. You can share the framed and labeled picture with friends via Facebook or email. I have applied PhotoAge to my pictures as well as pictures of friends and it continues to disappoint. So far there have only been about 2 times that the age guessed was within 5 years of the actual age. The rest have been numbers like 56 years old or 40 years old, for pictures that are of people in their early 20s. On the app’s iTunes page the suggestion is to “amaze your friends” by letting PhotoAge “tell them how old they look” in a photo. If you were to take a picture of a friend, and “let PhotoAge tell them” that they look a good 25 years older than they really are, that person would probably no longer be your friend. AppSafari review of PhotoAge was written by Vanessa Paszterko on November 17th, 2010 and categorized under App Store, Photos, Social. Page viewed 6564 times, 2 so far today. Need help on using these apps? Please read the Help Page. I like this app, i find it pretty accurate to (when you follow instructions). I think the face reading tech is spot on. That doesnt mean you get your exact age, it just means – thats the age you look like in the photo. Lighting has a lot to do with it, just like how photographers used advanced lighting to make models look their best. overall i think the app is pretty good and accurate age identifier for photos.